At the age of 6, Wilkins was brought to England and educated at King Edward's School, Birmingham. He studied physics at St. John's College, Cambridge, taking his degree in 1938. He then went to Birmingham University, where he became research assistant to Dr. J. T. Randall in the Physics Department. They studied the luminescence of solids. He obtained a Ph.D. in 1940, his thesis being mainly on a study of thermal stability of trapped electrons in phosphors, and on the theory of phosphorescence, in terms of electron traps with continuous distribution of trap depths. He then applied these ideas to various war-time problems such as improvement of cathoderay tube screens for radar. Next he worked under Professor M. L. E. Oliphant on mass spectrograph separation of uranium isotopes for use in bombs and, shortly after, moved with others from Birmingham to the Manhattan Project in Berkeley, California, where these studies continued. In 1945, when the war was over, he was lecturer in physics at St. Andrews' University, Scotland, where Professor J. T. Randall was organizing biophysical studies. He had spent seven years in physics research and now began in biophysics. The biophysics project moved in 1946 to King's College, London, where he was a member of the staff of the newly formed Medical Research Council Biophysics Research Unit. He was first concerned with genetic effects of ultrasonics; after one or two years, he changed his research to development of reflecting microscopes for ultraviolet microspectrophotometric study of nucleic acids in cells. 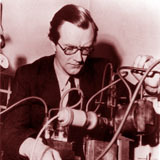 He also studied the orientation of purines and pyrimidines in tobacco mosaic virus and in nucleic acids, by measuring the ultraviolet dichroism of oriented specimens, and he studied, with the visible-light polarizing microscope, the arrangement of virus particles in crystals of TMV and measured dry mass in cells with interference microscopes. He then began X-ray diffraction studies of DNA and sperm heads. The discovery of the well-defined patterns led to the deriving of the molecular structure of DNA. Further X-ray studies established the correctness of the Watson-Crick proposal for DNA structure. Wilkins became Assistant Director of the Medical Research Council Unit in 1950 and Deputy Director in 1955. A sub-department of Biophysics was formed in King's College, and he was made Honorary Lecturer in it. In 1961 a full Department of Biophysics was established. He was elected FRS in 1959, given the Albert Lasker Award (jointly with Watson and Crick) by the American Public Health Association in 1960, and made Companion of the British Empire in 1962.